Plant where bees will visit. This is probably the most important. You can have colorful flowers of all shapes and sizes, but the bees need to find them. Bees love sunny spots that are sheltered from the wind. Don’t use pesticides. Most pesticides are not selective and can kill off beneficial bugs along with other pests. If you must, use the least-toxic formula and follow the directions carefully. Choose colorful flowers. Bees have good color vision. 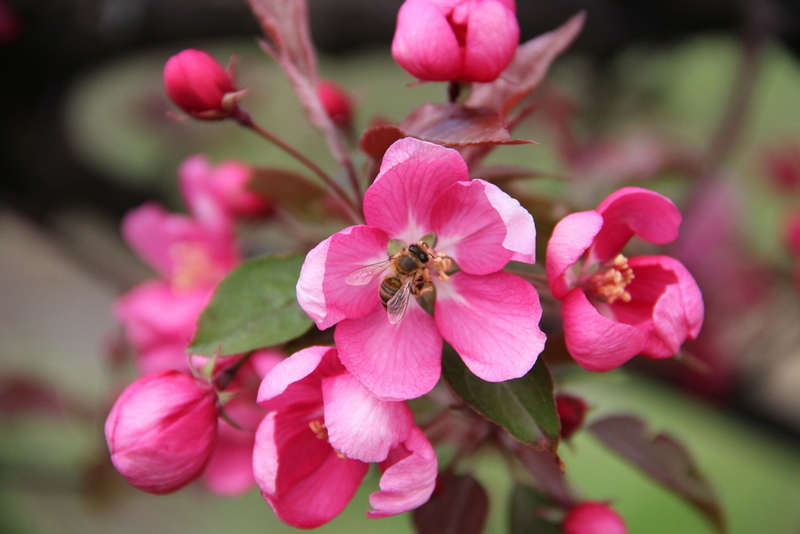 To help them find flowers (and thus the nectar and pollen), plant bright colors. Blue, purple, white and yellow all attract bees to your garden. Plant in groups. Clusters of flowers are most attractive. This is why bees flock to your flowering containers and pots. Plant flowers of different shapes and sizes. There are 4,000 different species of bees in North America, and they are all different sizes. Providing a range of flower sizes means all bee species can find nectar and pollen using their tiny legs and tongues. Have a diversity of plants flowering all season. Having a range of flowering plants means you can support a wider range of bees flying by your garden at different times in the season. Plant native. Native plants are far more attractive to native bees than exotic flowers. Natives also are usually well-adapted for your climate and growing conditions.